The old city of Hoi An was the most pleasant surprise of our first trip. All the guidebooks will tell you that the city is a picturesque village "lost in time" as it were. Jaded Asian travelers that we are, we expected a Singapore-style block or so of old buildings gutted and rebuilt to look like what we think old buildings should look like, but with all the modern amenities, like air conditioning. That definitely does not describe Hoi An. We're talking serious quantities of old buildings - old inside and out. Before we go too far, let's be sure to point out that Hoi An is very tourist oriented. You're never more than a few meters from an art gallery, or a tailor. More on that later. Still, it is like a whole town went into stasis some time at the end of the nineteenth century and only came out a few years ago. If it wasn't for the power lines and television aerials, it could be the 1940's. The old town area covers about a dozen blocks. At one end is one of the more interesting sites, the Japanese covered bridge. Some of the most notable buildings within the old town itself are the Chinese congregation halls built by Chinese settlers from various regions of China. Also be sure to set aside some time to browse through the central market. If you have time, a tour of the nearby river and its islands by boat is worthwhile. 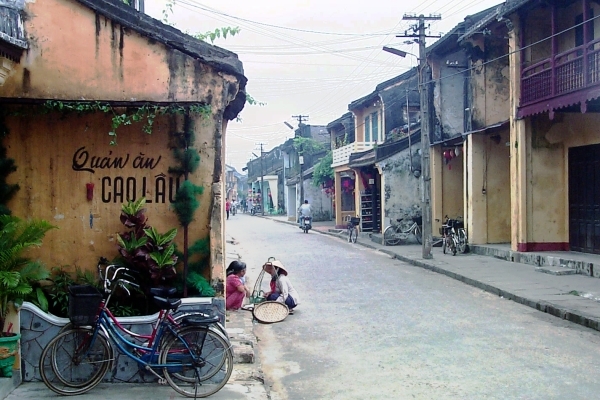 NOTE: The old city of Hoi An is now a world heritage site. Many of the places described here require the purchase of a ticket for 90,000 Dong (-90,000.00 USD) which allows you to visit five places. Tickets can be purchased at your hotel or at one of several information booths around the edge of the city.